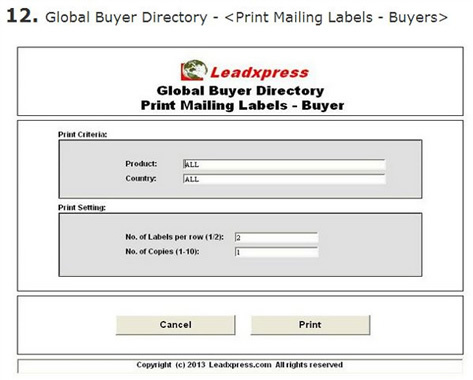 On the (Print Mailing Labels - Buyers) screen, you may use country and/or product name to select buyers to print buyers' mailing labels so that you may send samples, catalogues and other promotional materials to the targeted buyers. You may also select to print labels in 1 column x 8 labels per column or 2 column x 8 labels per column. In addition, you may click (Print Mailing Labels - Import Association) to print mailing labels for worldwide importers organizations. 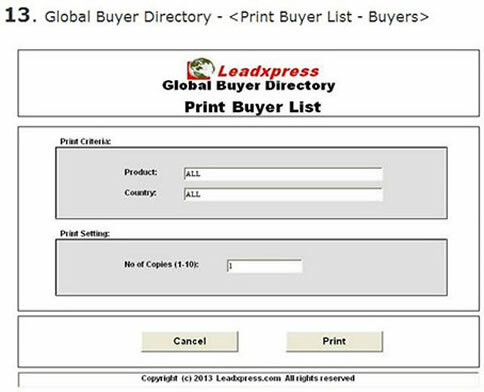 You may use product and/or country as the printing criteria to print buyer list. Besides, you may print gobal importers' organization list by selecting (Print Association List) under the pull-down menu.